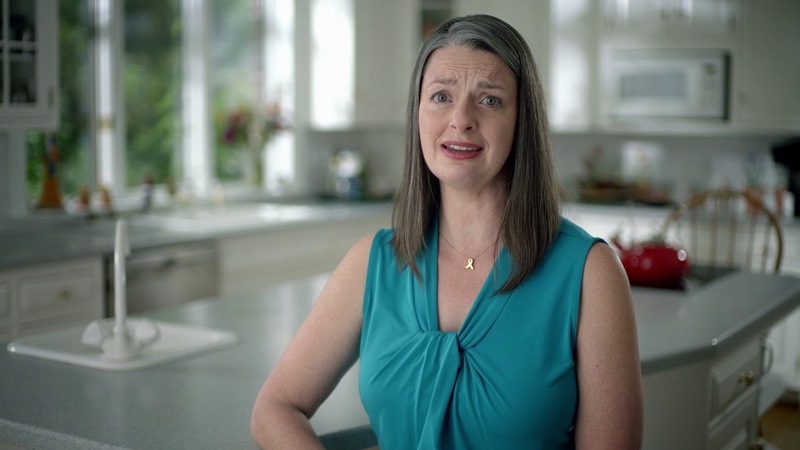 Breaking down the attack ad that’s roiled the U.S. Senate race in PA.
Stacie Ritter of Lancaster County, an advocate for coverage of pre-existing conditions, is shown in a campaign ad for incumbent Democratic Senator from Pennsylvania Bob Casey. Oct. 20, 2018, 10:00 a.m.
A television ad has roiled the race for U.S. Senator from Pennsylvania over claims the Republican challenger voted to let insurance companies strip protections for pre-existing conditions. The Republican challenger has called the ad inaccurate and cruel, since his own grandson is fighting cancer. The ad in question is running in support of Democratic incumbent Sen. Bob Casey and takes aim at Casey’s opponent, Congressman Lou Barletta, R-PA-11. In the 30-second clip, Stacie Ritter of Lancaster County, the mother of twins with cancer and an advocate for coverage of pre-existing conditions, says, “In Congress, [Lou] Barletta voted to let insurance companies strip coverage for pre-existing conditions. Why would I ever vote for Lou Barletta?” The ad has since been pulled in Barletta’s home market of Scranton following his objections. But is the claim true? Here’s what we found. First, what are pre-existing conditions? A pre-existing condition is a health problem — examples include cancer, diabetes or asthma — that you had before the date new health coverage starts, according to the U.S. Department of Health and Human Services. Before the Affordable Care Act, also known as Obamacare, insurers in the individual market could deny coverage to people with pre-existing conditions like these or charge them much more for coverage. The ACA banned this practice and was signed into law by President Barack Obama in 2010. The law also made it more palatable for insurers to cover people with pre-existing conditions by requiring everyone get insurance, offsetting those added costs for companies with payments from more healthy individuals who don’t submit claims. Republicans, including Barletta, voted to repeal or defund the ACA on multiple occasions, beginning almost as soon as it was signed into law. In 2011, Barletta was among 245 House members, all but three of them Republicans, who voted yes on a piece of legislation titled “Repealing the Job-Killing Health Care Law Act.” There was no mention of a replacement plan at the time or, for that matter, any new plan to ensure coverage for those with pre-existing conditions. All of those bills made it through the House. None made it through the Senate. Casey’s campaign points to Barletta’s support for repealing Obamacare as evidence he supports ending protections for pre-existing conditions contained in that law. “The AHCA specifically clarifies that its provisions cannot be construed as allowing insurers to limit coverage for those with pre-existing conditions,” Barletta campaign spokesman David Jackson told PolitiFact Pennsylvania. Republican U.S. Rep. Lou Barletta will take on U.S. Senator Bob Casey, a Democrat, in November. PolitiFact concluded that the waivers would have allowed people with pre-existing conditions to be charged “thousands or even tens of thousands of dollars more per year,” citing studies by the Brookings Institution and the Center for American Progress. Qualifying gaps in coverage were identified as those lasting 63 days or more. A Kaiser Family Foundation analysis estimated that 6.3 million people — 23 percent of 27.4 million non-elderly adults with a gap of several months in insurance coverage in 2015 – could have potentially faced higher premiums under the AHCA, due to pre-existing health conditions. And experts warned that high-risk pools meant to keep premiums lower for sick people under the AHCA might not be effective given the extent of government funding provided in the bill. In Casey’s ad, though, the statement about Barletta voting “to let insurance companies strip coverage for pre-existing conditions” coincides with a graphic displayed on screen. That graphic reads “Lou Barletta let insurance companies deny coverage for pre-existing conditions” and includes a footnote citing his vote for the AHCA in support of that claim. The AHCA did not let insurers “deny coverage for pre-existing conditions,” at least not outright, but it did weaken protections for patients with pre-existing conditions as contained in the ACA. Barletta voted for Obamacare repeal bills that did not include keeping protections for pre-existing conditions and which coincided with no replacement measures addressing the issue. He also voted for the AHCA, which forbade insurers from denying coverage to people with pre-existing conditions but also weakened the protections in the law it sought to repeal and replace. For this reason, the graphic in the Casey ad equating Barletta’s AHCA vote with allowing insurers to “deny coverage” to people with preexisting conditions is misleading. But Ritter’s statement that “Barletta voted to let insurance companies strip coverage for pre-existing conditions” is accurate given his voting record before the AHCA and his votes to repeal the law that originally codified those protections, including without a replacement plan in place. For these reasons, we rate the claim spoken in Casey’s ad True. Want some more? Explore other PolitiFact Pennsylvania stories. PolitiFact Pennsylvania is a partnership of The Incline and PolitiFact.com, a Pulitzer Prize-winning Web site of the Tampa Bay Times, to help you find the truth in politics. Every day, reporters and researchers examine statements by Pennsylvania elected officials and candidates and anyone else who speaks up on matters of public importance. We research their statements and then rate the accuracy on our Truth-O-Meter.